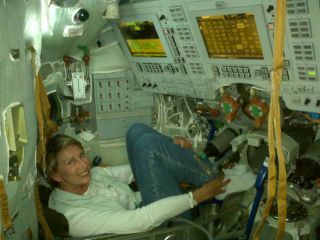 American aviation attorney Barbara Barrett, a former U.S. ambassador to Finland, trains in a mockup of a Russian Soyuz spacecraft. She is the backup to Canadian space tourist Guy Laliberté, founder of the Cirque du Soleil, who is set to launch in Sept. 2009. A formerU.S. ambassador to Finland has begun training to fly aboard a Russian spaceshipas the backup for a Canadian space tourist set to blast off in September. Americanattorney Barbara Barrett is training as abackup crew member for a Russian Soyuz flight slated to deliver Cirque deSoleil founder Guy Lalibert? to the InternationalSpace Station for a 12-day stay this fall, according to Space AdventuresLtd., the Vienna, Va.-based firm that organized the training and flight. ?Trainingas a backup for the September space launch is an adventure - and education - ofa lifetime,? said Barrett, a former deputy administrator of the U.S. FederalAviation Administration (FAA), in a statement. ?The space frontier inspiresyoung people today just as it did Galileo and Copernicus centuries ago.Students today who build science and math skills will have access to the thrillof space travel almost routinely in their lifetimes." An aviation attorney who became theFAA?s first female deputy in 1988, Barrett is an instrument-rated pilot and hasserved on the boards of a number of aerospace companies, including Raytheon,the Space Foundation and The Aerospace Corp.
Barrettalso was the first woman to run for governor in Arizona, losing the state?s1994 Republican primary to incumbent Gov. Fife Symington. More recently, she servedas U.S. ambassador to Finland from April 2008 to January 2009. Herhusband, Craig Barrett, is a former chairman and chief executive of chip-makerIntel Corp.
Barrett is trainingalongside Lalibert? at the Gagarin Cosmonaut Training Center outsideMoscow, but only Lalibert? is booked on the Soyuz TMA-16 flight slated tolaunch Sept. 30 from the Central Asian spaceport of Baikonur Cosmodrome inKazakhstan. Lalibert?is the seventh person in history to arrange a paid, multimillion-dollar trek tothe International Space Station, though his flight is the eighth privateorbital spaceflight since 2001. American billionaire Charles Simonyi flew tothe station twice, in 2007 and again earlierthis year, under deals between Russia?s Federal Space Agency and SpaceAdventures. If Lalibert?is unable to fly for any reason Barrett would take his place, a situation thatarose only once before in 2006. During that instance, Japanese businessman DaisukeEnomoto was replaced by his backup, American entrepreneur Anousheh Ansari, whowent on to fly an 11-day mission to the station. SpaceAdventures has arranged every private spaceflight to the International SpaceStation since the 2001 launch of American businessman Dennis Tito. The flightshave recently been pegged at about $30 million per trip, though Lalibert? hasnot specified the cost of his trip. IfLalibert? is cleared for the flight, he will fly with Russian cosmonaut MaksimSurayev and NASA astronaut Jeffrey Williams, both of whom are due to remain atthe station until March 2010. The spacestation is currently hometo six people - two Russian cosmonauts and one astronaut each from theU.S., Japan, Canada and Belgium. The spaceflyers are the first full-sized crewfor the station and represent all of the major international space agenciesbuilding the $100 billion orbital outpost. SPACE.comSenior Editor Tariq Malik contributed to this report. Image Gallery - Charles in Space!